This truly wounds my heart. 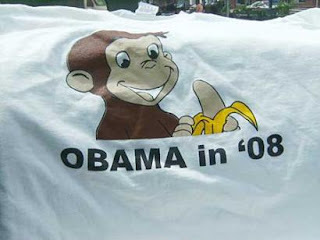 I've just found out about racist paraphernalia sold by a Republican vendor in Texas as part of the anti-Obama campaign. These buttons have slogans such as "Let's keep the White House White..."
It is really depressing that despite the triumphs of the Democratic party and the achievements of a potential great leader, some Americans still demonstrates ignorance of the highest calibre. Please don't get me wrong, I was never naive enough to think for a second that the next five months were going to be easy however I never conceived it possible that this type of derogatory message could make it into Republican campaign rallies. This is simply mouth-dropping. C'mon Americans (white, black, yellow, blues ... whatever your political preference, we can do better than this). You are way too intelligent to treat democracy with such shallow roots. don't you mean "mezmerize" instead of memorize?